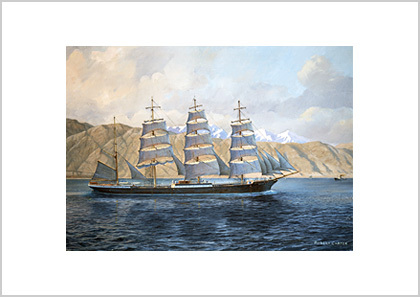 Deep-laden with saltpetre, the 4-masted barque Padua heads south for Cape Horn and the voyage home to Hamburg. 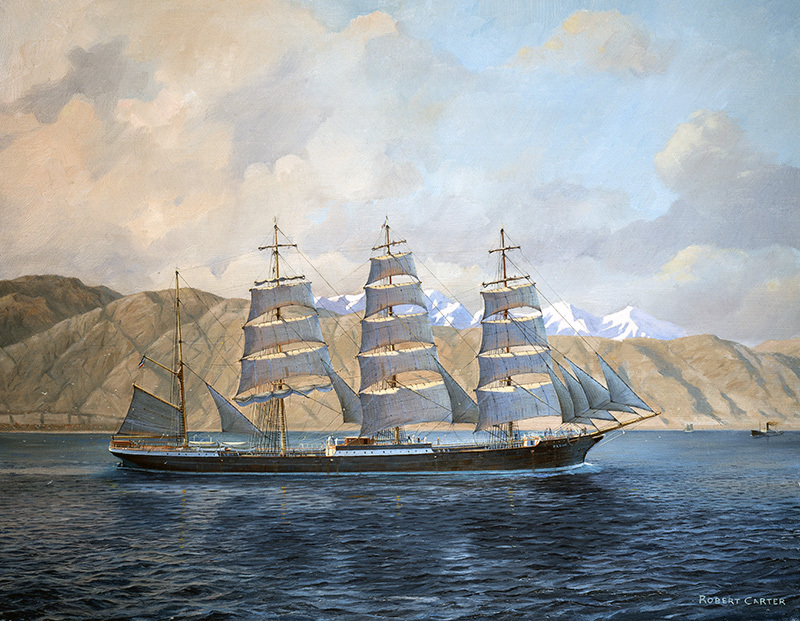 Along with Priwall and Peking, she was the last of the German nitrate fleet; a symbol of the trade that existed between Chile and Germany for over 50 years. The harsh coastline south of Caleta Buena stands out boldly – a backdrop familiar to most who served in square rigged ships in the early twentieth century; hot, dusty and arid, a collection of huts and sheds, small jetties, with barges used to ferry nitrate out to the ships anchored offshore; an almost sheer wall of dry rock, rising to heights of 1000 metres; a mountain plateau inland from this coastal escarpment, acting like foothills to the snow-clad peaks of the Andes and their coastal spur – the Cordilleras, rising to over 4000 metres and visible 50 miles out to sea. Even the waters that abut this coastline are unfriendly and unforgiving; the seamanship acquired off Cape Horn, being of little use if a ‘Norther’ strikes while at anchor at the base of this great wall. This vicious gale builds up rapidly without warning and the sailer’s crew could only hope that their anchors would hold until it passed. Many ships dragged ashore before this wind and the ever-present Pacific swell. Padua was built in 1926 for the F. Laeisz company. When the nitrate trade declined in the early 1930’s, following the development of synthetic nitrates in Germany, Padua went into the Australian Grain trade, until 1939. She spent the war making short voyages within the Baltic Sea. Claimed by Russia as reparations, she became the training ship Kruzenshtern and as such is the largest training ship afloat today. Deep-laden with saltpetre, the 4-masted barque Padua heads south for Cape Horn and the voyage home to Hamburg. Along with Priwall and Peking, she was the last of the German nitrate fleet; a symbol of the trade that existed between Chile and Germany for over 50 years. The harsh coastline south of Caleta Buena stands out boldly – a backdrop familiar to most who served in square rigged ships in the early twentieth century; hot, dusty and arid, a collection of huts and sheds, small jetties, with barges used to ferry nitrate out to the ships anchored offshore; an almost sheer wall of dry rock, rising to heights of 1000 metres; a mountain plateau inland from this coastal escarpment, acting like foothills to the snow- clad peaks of the Andes and their coastal spur- the Cordilleras, rising to over 4000 metres and visible 50 miles out to sea.